Reuters writers Richard Valdmanis and Timothy Gardner reported on Tuesday that, “A backlash against biofuels that are widely blamed for contributing to a staggering spike in global food prices could have the unintended consequence of intensifying a rally in the cost of energy. The article noted that, “‘In a limited way, the use of biofuels can help slow the acceleration of gasoline prices. So if you did have a backlash that results in the biofuels mandates being reversed, that would result in more use of petroleum-derived fuels and, theoretically, in higher (energy) prices,’ said Eric Wittenauer, an energy analyst at A.G. Edwards in St. Louis. Later, the Reuters authors stated that, “Predictably, U.S. ethanol lobbyists paint a dire picture of what reduced mandates would do to gasoline prices. The Renewable Fuels Association, an industry group, last week warned that pump prices would jump more than a dollar a gallon if U.S. regulators followed Texas Gov. Rick Perry’s proposal to waive half the 2008 mandate for 9 billion gallons of ethanol. “But energy experts called that prediction overblown, saying the pump price of gasoline would probably rise just pennies a gallon. Recall that on Wednesday, the U.S. Senate Committee on Foreign Relations held a hearing entitled, “Responding to the Global Food Crisis.” Complete details, including a video replay of the hearing, can be found here; while a FarmPolicy.com audio summary of the event is available here (MP3-10:02). The audio summary (MP3) focuses particularly on testimony provided by Edward Lazear, chairman of President George W. Bush’s Council of Economic Advisors. On Tuesday, Reuters writer Missy Ryan reported that, “High global food prices are likely to linger for two to three years while the world replenishes food stocks, senior White House officials said on Tuesday. “‘Our estimate is that those prices will continue to stay high, not escalate at the same rate as they did last year,’ Edward Lazear, chairman of President George W. Bush’s Council of Economic Advisors, said in an interview. The Reuters article added that, “Biofuel production is widely seen as another driver in higher food prices, which jumped 43 percent in the year through March. The White House experts underscored that they did not think alternative fuels like ethanol truly play a big role in higher food costs. “‘Those who are arguing that the president’s increase in the (renewable fuels standard) is contributing to high food prices are incorrect,’ Keith Hennessey, director of the National Economic Council, said in the same interview. 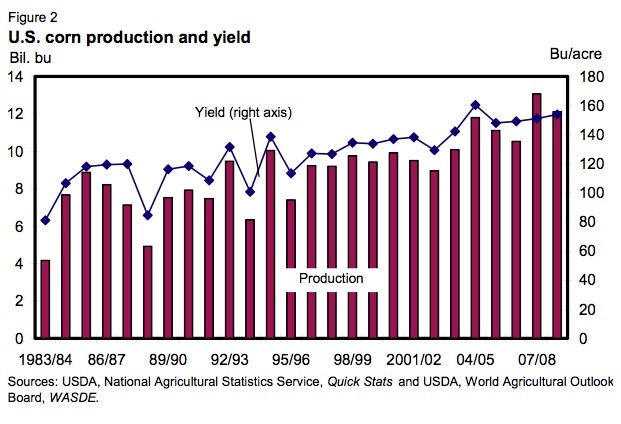 Also on Tuesday, USDA’s Economic Research service issued the May Feed Outlook report, which noted in part that, “The 2008/09 corn crop is projected at 12,125 million bushels, down from the record 13,074 million bushels a year earlier. This year-over-year change stems from a 7.6- million-acre expected decrease in planted area to 86 million acres. Planted area is from the Prospective Plantings report. Harvested acreage is based on estimated demand for silage based on roughage-consuming animal units (RCAU) and historical abandonment over the years 2005-07. Later, the Feed Outlook report indicated that, “Total corn use is projected at 12,760 million bushels this year, down from 13,010 million the previous year. This year-over-year decrease stems from decreased exports and feed and residual use, as FSI [food, seed and industrial] use is up. 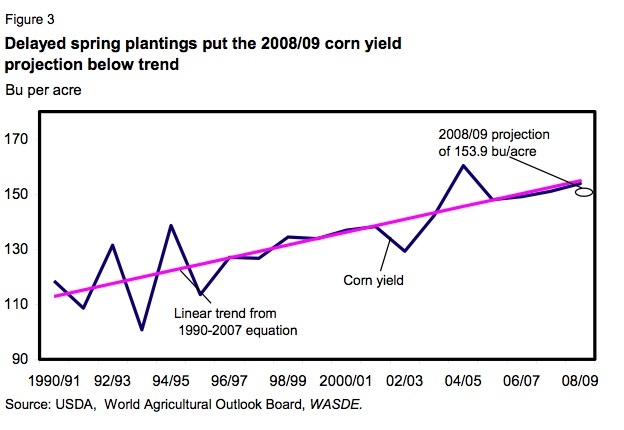 FSI use is projected at 5,360 million bushels, up from 4,360 million bushels expected in 2007/08. Increased ethanol production is driving the year-over-year increase. Exports for 2008/09 are projected at 2,100 million bushels, down 400 million from the previous year. Expected record corn prices and record supplies of distillers’ grains are forecast to sharply lower feed and residual use of corn in 2008/09. 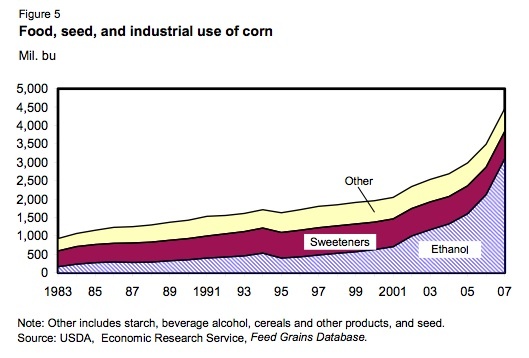 Corn feed and residual in 2008/09 is projected down 850 million bushels from the 6,150 million bushels expected to be used in 2007/08.” (A related graph on food, seed and industrial use of corn, is available here). Reuters writer Terry Wade reported on Wednesday that, “A bitter debate over biofuels, blamed by critics for high global food prices and deforestation, threatens to dominate a meeting of European and Latin American leaders in Peru this week. “The European Union and Brazil, the world’s largest ethanol exporter, say biofuels can help curb reliance on oil and reduce greenhouse gases. The Associated Press reported on Wednesday that, “German Chancellor Angela Merkel warned that biofuel production should not come at the expense of the environment on Wednesday as she began a Latin America tour in Brazil, the planet’s chief ethanol exporter. “‘Biofuels are a way toward replacing classic fossil energy sources, but only if they are cultivated sustainably,’ Merkel said as she met Brazilian President Luiz Inacio Lula da Silva. “Brazil is the world’s largest ethanol exporter and second-largest producer, and is home to about 70% of the Amazon rain forest. The European Commission has said it wants to avoid importing biofuels grown on land largely untouched by humans or rich in wildlife. The article added that, “In the summit’s final declaration, leaders vowed to fight poverty, drugs and crime and said they were ‘deeply concerned by the impact of increased food prices,’ which have spiraled as global demand for commodities soars. The AP item stated that, “The declaration also encouraged free trade and cooperation on biofuels, although those goals were not as universally endorsed. “Bolivia and Ecuador in particular resisted plans for a trade association between the Andean Community and European Union, while Brazilian President Luiz Inacio Lula da Silva was forced to defend biofuels such as ethanol –of which his country is the world’s largest exporter. Steven Mufson reported in Saturday’s Washington Post that, “The Bush administration yesterday halted purchases of crude oil for the nation’s Strategic Petroleum Reserve, reversing its policy on the emergency reserve three days after Congress voted overwhelmingly in favor of suspending the purchases to ease the upward pressure on oil prices. “The Energy Department announced that it would not sign contracts to buy up to 13 million barrels of crude that would have been delivered to the underground salt caverns on the Gulf of Mexico coast in Louisiana and Texas between July and December. The article added that, “Bush’s reversal came on the day that Saudi Arabia announced that it was increasing its output by 300,000 barrels a day for the month of June. Though the announcement came after Bush met with Saudi King Abdullah, Saudi oil minister Ali al-Naimi said that the decision was made a week ago in response to requests for bigger volumes from 50 of its customers worldwide. And Dan Molinski reported in Saturday’s Wall Street Journal that, “The dollar fell hard Friday on the jump in global oil prices and news that showed U.S. consumer sentiment at its lowest level in decades. “U.S. rice futures fell 27.5 cents to settle at $20.065 per 100 pounds on the Chicago Board of Trade, after earlier falling to $19.660, the lowest level since April 4. U.S. rice futures have fallen 10 percent this week and are well below their all-time high of $25.07 per 100 pounds, reached April 24,” the article said. Andrew Martin reported in today’s New York Times that, “Grocery bills are rising through the roof. Food banks are running short of donations. And food shortages are causing sporadic riots in poor countries through the world. “You’d never know it if you saw what was ending up in your landfill. As it turns out, Americans waste an astounding amount of food — an estimated 27 percent of the food available for consumption, according to a government study — and it happens at the supermarket, in restaurants and cafeterias and in your very own kitchen. It works out to about a pound of food every day for every American. “Grocery stores discard products because of spoilage or minor cosmetic blemishes. Restaurants throw away what they don’t use. And consumers toss out everything from bananas that have turned brown to last week’s Chinese leftovers. In 1997, in one of the few studies of food waste, the Department of Agriculture estimated that two years before, 96.4 billion pounds of the 356 billion pounds of edible food in the United States was never eaten. Fresh produce, milk, grain products and sweeteners made up two-thirds of the waste. An update is under way. Mr. Martin added that, “The study didn’t account for the explosion of ready-to-eat foods now available at supermarkets, from rotisserie chickens to sandwiches and soups. What do you think happens to that potato salad and meatloaf at the end of the day?